Henley-on-Thames is known around the world for the Royal Regatta, yet it is seen more often on TV screens in over 100 countries as one of the locations for the fictional county of Midsomer in the classic show Midsomer Murders, known in much of the world as Barnaby. Fans of Detective Barnaby will recognise many of the filming locations within the town and surrounding villages from their appearances in numerous episodes. Centrally located with all the facilities you would expect in a thriving market town, Henley is an ideal base for an extended stay in Midsomer. 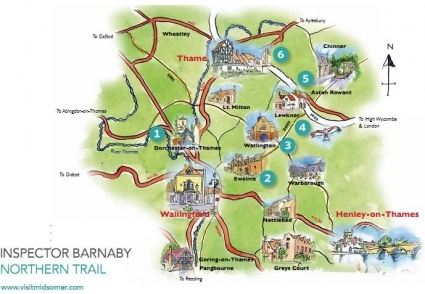 You can find out more about the connection with Henley and follow an easy walking tour by clicking on the image on the right to download a leaflet in pdf format, or call into the Visitor Information Centre at The Town Hall and pick up a free copy. 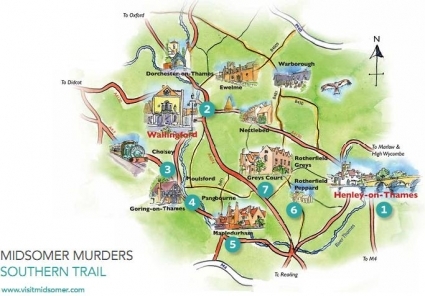 Alternatively, the following two driving tours pass through Midsomer Murders countryside including Henley and many locations nearby. Travelling without a car? Rail and bus routes to the area lead to many walking and cycle paths. An overnight stay is recommended to stop, eat and enjoy the routes at your leisure. Taking in Causton Playhouse and Badgers Drift Primary School, as well as opportunities to enjoy manor houses, village pubs, museums, river trips and a steam railway. Covers Henley on Thames - Nettlebed – Wallingford – Moulsford - Goring - Mapledurham - Rotherfield Peppard/Rotherfield Greys - Henley on Thames (total drive time approximately 3 hours). Taking in Midsomer Newton Museum and Causton Library, as well as pubs, churches and shops filmed for the series; with options to visit the gardens and nature reserves set in Midsomer countryside. Covers Dorchester - Wallingford - Ewelme – Watlington – Lewknor – Aston Rowant – Chinnor – Thame – the Miltons and the Haseleys – Dorchester (total drive time approximately 3.5 hours). For more information about visiting Midsomer, including information about guided tours and places to stay, go to www.visitmidsomer.com.